Albert Hammond has been writing and co-writing hit songs for over forty years; among them The Hollies' The Air That I Breathe; Leo Sayer's When I Need You; Whitney Houston's One Moment In Time and Aswad's Don’t Turn Around. Albert recently went back in to the studio to record a new 4 track EP which contains a new song I Guess I Really Had It Coming and also his most successful song It Never Rains In Southern California featuring his friend Al Stewart as a duet partner, and Changing Me a duet song with his son Albert Hammond Jnr. The EP coincides with a date at Newport Riverfront on April 28 as part of the UK leg of his world tour. Andy Howells recently put questions to the music legend. What’s the earliest song you can remember writing and what inspired it? The earliest song I can remember writing is a song called Blue Boy and I wrote it for a girl 14 years old from Scotland whom I fell in love with, I was 15. One of your earliest song writing successes of which you collaborated with Mike Hazelwood was Little Arrows which was a hit for Leapy Lee in 1968. What did it feel like when you had your first taste of success? Little Arrows written with Mike Hazlewood was my first big hit, I met Leapy Lee one night down in Shepherd's Bush, I went with my Aunt to play bingo and Leapy was there we got to chat and he said he was a singer and knew Gordon Mills, (Tom Jones manager) so I played him Little Arrows and the next day we went to see Gordon who loved the song and made a great record with Leapy. It became a hit all over the world and sold over five million copies, it was a dream come true. Mike and you were also in the band The Family Dogg; did you find it difficult to get established as a musician when you were already having major success as songwriters? The Family Dogg was a group I formed with Steve Rowland who I knew from years before in Spain, the idea was to form a group like The Fifth Dimension, it was great for the time it lasted and it was a vehicle for Mike and I to write songs for. Out of all the songs you have written do you have a favourite? Well it's hard to choose a favourite, I've had so many hits and they're all favourites’ but to answer your question here are two favourites’, One Moment in Time (recorded by Whitney Houston) and The Air that I Breathe (recorded by The Hollies). Tell us about your latest EP I Guess I Really Had It Coming, what was the inspiration behind that? The EP is something my record company Hypertension put out to promote the tour, the song I guess I really had it coming is a song I wrote in Russia in 1987 but I forget what inspired it. You are playing some UK shows soon what can fans expect to hear at them and what do you enjoy most about playing live? Songbook is a unique show that takes Audiences through the soundtrack of their lives and what I enjoy the most about Songbook is how much audiences enjoy it and how happy it makes them. Do you have a favourite songwriter? 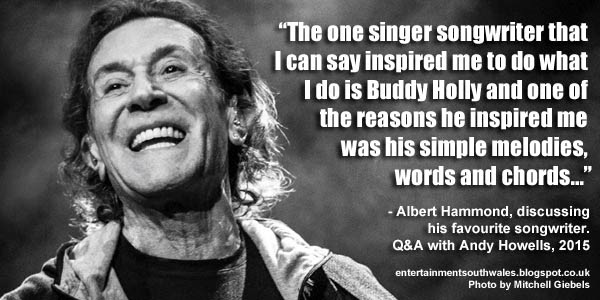 I admire many songwriters but the one singer songwriter that I can say inspired me to do what I do is Buddy Holly and one of the reasons he inspired me was his simple melodies, words and chords.